The world needs creativity to cope with and to solve a myriad of problems. Yet, studies show that as American children grow from toddlers to adolescents, they exhibit less creativity. “We set up these nice problems and tell children there is always a right answer. We don’t let them find the problems. As a consequence, as adults they don’t know how to identify the issues and problems facing society, let alone how to come up with new ideas for solving them,” says Janet Sawyers, professor of family and child development at Virginia Tech. This does not have to happen, she says. 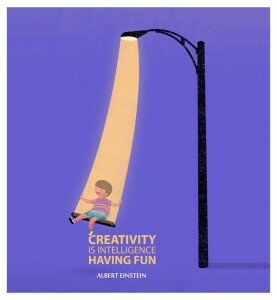 Schools, parents, and society can nurture children’s creativity. How do you measure creativity? in a four year old? Name as many things as you can think of that are blue. “Cold hands,” is an imaginative response. Name uses for a box, and for paper. “The most creative people give the most unusual responses at the end of the response series,” Sawyers explains. Statistical infrequency is a measure of originality. The idea test has turned out to be the best single measure predicting real-world accomplishment. Design students in college who tested high on creativity were the students whose design projects were judged the most outstanding. The researchers tested a group of children when they were four, again at five to seven, and again at 10 and 11, and will test them again in high school. They found that children who measured high in creativity at early ages continue to be high. The scores are more stable than IQ tests, Sawyers says. Teachers should be cautious in assuming that precocious children are necessarily creatively gifted, especially at the expense of failing to encourage the creative child who may not stand out as a young scholar. Creative children are often not included in programs for the gifted and talented because the measures used for identification don’t reflect creativity. “Exploration and play … are the basis for creative problem solving and lifelong learning. Creative thinking is fostered in classrooms where children are given opportunities to explore new materials and ideas, play with these materials or ideas, and construct new knowledge and skills,” the text explains. For example, if the teacher tells the student how to build a truck with Legos, and the Lego kit includes wheels so even that problem is solved, there is little room for creativity. “The process of exploration and play is not confined to preschool and kindergarten classrooms; it also exists in the journals kept by third graders or students in college literature and biology classes,” the researchers write. “Creativity not only appears in music, art, or literature,” says Sawyers, “but throughout the sciences and social studies fields. There are times in school and in society when we must conform, but there are also times when we need to know how to look at things differently from everyone else. This material may be reprinted so long as Virginia Tech and the researchers are credited. The illustrations are copyrighted and may not be used separately from the text. Address questions about “Science at Virginia Tech” to Susan Trulove (strulove@vt.edu), 540-231-5646.